Food is served every day from Noon until 10 p.m.(Sundays until 9 p.m.) Including the Winter Warmer Breakfast served daily from Noon. Prices: 1 Adult course - £6.50; 2 Adult courses - £8.95 Children: £4.80 and £7.25 respectively. Served from Midday until 4 p.m. every Sunday. Congratulations to The Star for being awarded and again retaining the maximum five stars for food hygiene by North Norfolk District Council and also for being included in CAMRA's Good Beer Guide 2018 - making it eight years on the trot! Craft Fayres, run by Norfolk Creative Crafters, will hold the next one from 10 a.m. to 3 p.m. on Sunday 30th. September in Palling Village Hall. These are generally held on the last Sunday of each month from April to October inclusive. The next Parish Council meeting will be held on Tuesday 19th March commencing at 7.30 p.m. in the Village Hall. Everyone is welcome to attend. Dan Corbett, who died last November, lived in Sea Palling for 15 years from 1969. He was very active in the local community, being both a Parish Councillor and a District Councillor. He was also headmaster at Stalham first school and, with Barry Clark, was a founder member of the Palling volunteer lifeboat. His final wishes were for his ashes to be spread at sea from the lifeboat. This will occur on 14th July at 11am. All that knew him and would like to pay their respects are welcome at the beach to witness the event. A lunch buffet is being held for close friends and family afterwards. Dan’s son, Simon, would like to thank both the village hall and the lifeboat crew for their help and support for this event. 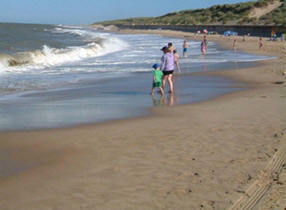 Volunteers are needed for the next beach cleaning session on Palling beach which will be held on Sunday 23rd. September (11 a.m.). Meet at the ramp by the Reefs Bar, Beach Road. Please come along and help keep the beach safe for wildlife and people and also help clear the oceans of plastic waste which is deadly to Sealife. Beach cleaning sessions are tide dependent and could be cancelled if the tide is excessively high or there are very severe weather conditions. Please check websites (see below). Lunch is served in the Church Rooms, Church Road from Noon onwards on the first Wednesday of each month. No charge but donations gratefully received. The next will be on Wednesday 5th. September. Scrabble & Cribbage. - if you'd like a game or prefer just a cup of tea then come along to the Church Rooms, Church Road on the Second Monday of the month from 2 p.m. to 4 p.m. Subs: £1 (includes refreshments) Everyone welcome. Located in the heart of the community, Sea Palling Community Library and Book Shop is a relatively recent addition to the other great facilities available in our village. Run by volunteers and using good clean second-hand books from our community, we have amassed over 4,500 books which are available to ‘rent’ or buy. We have many lovely books for sale: from recent novels to ‘Coffee Table Books’, Craft books, Cookery books, History books etc., as well as a diverse Childrens Section which includes everything from Thomas the Tank Engine to Treasure Island and much besides. We do have a wide range. Prices start from 75p. Tea,coffee and hot chocolate are available at 50p per cup/mug and the biscuits are free. All proceeds are used for the maintenance of the fabric of our church, some parts of which date back almost 1000 years, so as you can imagine it needs a lot of maintenance. If you find yourself without a book to read, or you need a present for a friend, we could well have just what you require, whether you live locally or are visiting the Sea Palling area, everyone is very welcome indeed. Please come and have a browse, there is no obligation. Your support would be most welcome and it would be great to meet you. The library is situated in The Nissen Hut, Church Road, Sea Palling. We are open from 10.30am until midday every Saturday morning, and 10.30am until midday on the first Wednesday of every month. Stalham Library offers a range of varied activities including Business Start Up Advice, French conversation and Under 5s Story Time amongst others. Further information may be had by either telephoning 01692 580794 or on-line at Norfolk County Council (www.norfolk.gov.uk) and following this pathway - Libraries - Opening times & locations - Stalham - list of events. Free Wi-Fi is available at the Library. All that's needed is your library card and PIN. Telephone Pat Letten 01692 652399 for bookings. The Art & Craft Group meet every Thursday afternoon from 2 p.m. to 4 p.m. in the Church Room, Church Road. Come along and join us for a couple of hours to draw, paint, sew or knit or whatever takes your fancy. Tea, coffee, cake and chatting are mandatory! Every Monday night from 7p.m. to 8.30 p.m.in the Nissen Hut, Church Road. Everyone is very welcome - abiliity to read music irrelevant; desire to sing preferable; sense of humour essential! Subs. are £2 - for more information please telephone Beverley on 598881. These popular events are held every month (except December) and it is essential to book a table (for a team of up to six people) for catering puposes. Please telephone 01692 598828 or 598464 or e-mail j.bird01@btinternet.com The current cost is £8.00 per person for the quiz together with a 3 course supper with vegetarian option. Please bring your own beverages. Telephone Alex on 01692 598029 for information on bookings.